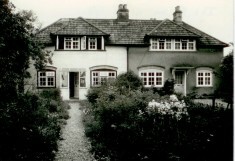 Chris and Catey moved to Harston, initially to 8, Haslingfield Road, in September 1968. (During and after World War 2, Chris had previously lived on the east side of London in Seven Kings, Essex, and Catey had lived in many different parts of the UK, since her father had been in the Royal Navy. Thus she had lived in Devonport Dockyard, and then in Banchory near Aberdeen for many years, and she had spent a few years in Stockholm, Sweden.) Their daughter, Gemma, was born in 1974 in the old maternity hospital in Mill Road, just before it moved to Addenbrookes New Hospital Site, and became ‘The Rosie’. Here follow their memories of some of the people who used to live in the Church Street- Button End- Haslingfield Road area of Harston (which is the older part of the village). ‘When we moved in to no. 8 Haslingfield Road, we were told by the previous resident that, earlier in the century, it had been occupied by (and indeed was built for), Ernest Northrop, who was the gardener for many years for the Greene family at Harston House, and who is ‘depicted’ in one of Graham Greene’s novels. (No. 6 and no. 8 were, of course, built at the same time, and we think no. 6 was first occupied by the Greene family’s dressmaker). When we moved in, it was occupied by an elderly married couple, members of the Wisbey family. Our immediate predecessor in no. 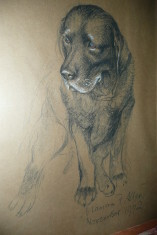 8 was a Mrs Carden, an elderly lady who had only been in residence there for a couple of years, or so. She had had the bathroom added (downstairs) before she moved in, so we had an internal toilet and bath and running water, with an electricity supply, but no gas supply. (Before Mrs Carden, the cottage would only have had an ‘outside toilet’, in a separate out-building). Our next-door neighbours on the west (ie river) side were the Willers family (builders and undertakers), at 10 Haslingfield Road, where Fred Willers and his brother Ernie both then worked, as did Fritz (Frank) Schoepp. The Willers’ daughter, Joy, was a keen horse-rider, and in the mid-1970s she introduced our daughter to the art (or hazards?) of riding on one of their donkeys – which has sparked a lifelong involvement with ‘unpredictable equines’! Fritz had ‘green fingers’ with all things drainage-related, and he cheerfully replaced our old septic tank (at 8, Haslingfield Road) with a much-better mains-drainage-junction. He also helped us with many small building projects. Michael Allen was the (Church of England) vicar for the benefice of Harston and Hauxton. He was married to Marion, and they had 2 school-age children, Frances and John. We became friendly with them because they were our near neighbours, and also from church-related activities. Michael was rather shy with strangers, and was a proficient mathematician; he preferred the high-church ritual and offered the healing power of ‘laying on hands’, thus helping many sick people of the parish, during his pastoral work. He fostered joint services with the Roman Catholics, and Hauxton church had a joint service with the Catholics for many years. He was a keen home-made-wine maker and the ‘then’ Harston vicarage (now Rhee House)’s cellar had an amazing cornucopia of home-made wines – dandelion, blackberry, banana, tea – you name it! (He regularly attributed the success of the vicarage garden blackberry crop to its proximity to the vicarage’s cesspit – these being the days before piped drainage in Harston!) One of his favourite stories was of an elderly (and rather deaf) parishioner who had replied to his enquiry ‘How is your husband today?’, with the response: ‘Very Windy – nearly blew me out of bed this morning’! Further east, in the cottage, No 5 Church Street lived Ann and Tony Jemmett, together with their son, Danny, and their daughter, Sadie, with whom we were friendly. Later on, Ann Jemmett emigrated to Germany in order to join a Steiner group (a religious sect in which women could become pastors). Catey was good friends with Jean Philips, who was living in Hurrell’s Row at that time; she had lived in Canada after the war, but then moved to Harston. Later, she moved to one of the cottages just north of the Post Office. She was a keen member of ‘Mensa’, and was also a very keen gardener. At the Church Street end of Hurrell’s Row, in a tiny one-room shop, Mr Webb, the clock-mender used to ply his trade. This was the era before throw-away digital watches, when all watches and clocks were still entirely mechanical. They were very expensive to buy, and they needed frequent tlc so as to keep them working satisfactorily! The owners of Harston House at that time were Terence and Irene Armstrong; Terence was then the deputy director of the Scott Polar Research Institute in Cambridge, and he often used to visit the Soviet Union during the ‘cold war’ era, to negotiate and liaise over ‘international’ polar research. Terence and Iris were very active members of the Harston church, and summer church fetes were regularly held in the gardens of Harston House. Turning towards Button End, we first met the Sellens (Cyril and Nora) when they invited us to join them as a small amateur group to play flute music together. 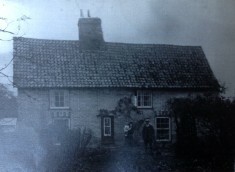 They lived in the house named ‘Willows’ in Button End – just before the entrance to Willow Farm. Cyril was an architect by trade, and had designed this house himself. He argued that houses in this region do not need such a steep-pitched roof as is usually used, so he gave it a much shallower pitch. Both Cyril and Nora Sellen were keen flautists, and Cyril was an enthusiast for the ‘open G-sharp’ version of the instrument, which, he argued, was a more logical design than the ‘closed G-sharp’ version – which is now almost universally the norm. Nora helped to organise some of the music concerts that were held in Harston in the final decades of the twentieth century. Hope Cottage is the only thatched cottage now remaining in Button End. It is very old, although no-one knows exactly how old. In the early 1970s, Peggy Johnson, the current owner, with her late partner, James Stokes, had Hope Cottage stripped right back to its wooden frame, and it was then restored to its present state. While this was happening, Peggy ‘lodged’ with us at 8 Haslingfield Road for several years, before our daughter was born. Near Hope Cottage, in number one, Beech Farm Cottages, used to live the Carter family. Their daughter Janet was quite severely disabled by spina bifida, and was confined to a wheel-chair. Jill Thorne was a really colourful character, whom we got to know quite well. She had been a resident in Button End for some years, and was living in a double-decker bus, adjacent to a patch of woodland on Willow Farm, on the left-hand side of Button End, that is owned by the Segrave family. Jill looked after many of the local stray and semi-feral cats in Harston and elsewhere. Some lived in or near her bus; others were in central Cambridge, where she visited and fed them regularly. Her bus had only minimal services, just a couple of paraffin stoves for heating and cooking; plus cold water from a standpipe. Despite her highly ‘unconventional’ lifestyle, Jill was very well-educated and also very knowledgeable. She was working as a secretary at the Cambridge University Board of Graduate Studies (‘BOGs’), in Cambridge. Her parents had previously lived in India, and her niece is the actress, Angela Thorne, who became especially well known for her role in the TV sit-com, ‘To the Manor Born’. Jill herself was an accomplished poet, and she had many of her poems published in the Cambridge Evening News in the 1960s/70s. Eventually she had to move into sheltered accommodation in Chesterton and spent her final months in a nursing home in Bottisham. Her disintegrating bus was then towed away to a bus museum. Another colourful ‘Button End’ character was Joan Harvey, who lived in a caravan near Jill in the late ’60s/70s, and who provided us with a pair of white cats soon after we arrived in Harston. She had a daughter called Mandy, and we understand that she later started a commune in another Cambridgeshire village. When we lived in Haslingfield Road it used to be possible to walk from Haslingfield, along the Harston side of the river Rhee, as far as the road bridge in Harston, and then to continue along the river bank (opposite Harston Church) to the Mill Pond (where many of the local children used to fish, and even swim, during the summer). One could continue walking up-river from there, still on the river bank, to join the footpath across to Barrington. These fields were regularly flooded during the winter months. We remember ‘Vera’s’ shop, selling haberdashery and clothes, on the east side of Royston Road, opposite Harston House. We also remember the Lawrance’s blacksmith’s forge, next to ‘The Pem’ in the High Street, and Mr Burl running the post office, with a greengrocer’s shop opposite (where the estate agent is now). In those days there were no fewer than five traditional pubs, all plying their trade in Harston: the Old English Gentleman; the Coach & Horses; the Three Horseshoes, the Pemberton Arms and the Queen’s Head. Sadly, all of these have now either been converted to restaurants, or changed their use completely, or else have closed. When we first came to Harston, Dr JC Townley was the only Harston GP, and his surgery was held in a house near the Coach and Horses pub in the High street. Dr Townley had been an army doctor in West Africa during the second world war, mainly in The Gambia, and much of that service was at Fajara, the principal Medical Research Council hospital on the Gambian coast near the capital, Banjul. The Harston GP surgery later moved to the far end of Harston in London Road (to Dr Townley’s own house.) In the 1970s, he was joined by Dr Nick Brierley, who then practised at the newly built Church Street surgery, where he was joined by our first lady doctor, Dr Hague, who then later became head of the practice. The Church Street surgery was made possible by the gift of some land that had belonged to another colourful (local) character, called ‘Eric’ (unfortunately we don’t know his surname). Eric had scarcely travelled anywhere beyond the Cambridge locality all his life. He regularly (and sometimes interminably!) chatted, from the garden gate of his house in Stag Villas – to any who were prepared, or had the time, to listen! He spoke in a broad East Anglian accent, with matching terminology! Favourite expressions included ‘little old boy’ (for a young male person) and ‘all round Will’s Mother’s’ – for any bus journey that meandered through the Cambridgeshire villages, – and especially for the now-defunct Premier Travel bus service, that pottered its way from Harston through Haslingfield, Barton and Newnham, to its eventual destination in central Cambridge!’. In 1977, we moved from Haslingfield Road to no. 10 Station Road (still in Harston), and were intrigued to learn from the deeds of this property, that before it was built (by Albert Hearn in 1965/6), the land that is now occupied by nos. 6, 8 and 10 Station Road and Linden House had previously been the site of a small farm named ‘Trigg Farm’, which had been occupied by the Thompson family. Earlier in the century, they had plied a coach service between several of the South Cambs villages, and had also been coal merchants (using the railway at Harston Station), as well as being local farmers, growing fruit and other produce. My parents, Arthur and Hazel Holt, lived on Pightle Close from 1966 until they moved to Haslingfield in the late 70s. They were great friends with Albert and Jean Hearn. I did some holiday jobs for them: raspberry picking, strawberry selling, building site work. I used to play darts for the Queen’s Head. I can remember two old Fred’s one of whom was the father of Roger and Peter, who played too. I can’t remember their surname but they lived on Haslingfield Road. The land that the Church Street Dr’s Surgery used to belong to was Eric Jacklin. I thought I would mention this as his surname had been forgotten. I came across your beautifully written account of life in Harston after searching the web for information on my relatives Stuart and Dorreen Segrave !